A Note from Fatty: This is the fifth in a series of who-knows-how-many posts about racers experiences with what I am now certain will be the annual 100 Miles of Nowhere. If you’re just now re-joining the blog after a long weekend, you may want to read previous posts to catch up. And if you were a racer and want to get your certificate, be sure to read this post, which gives instructions on what you need to do. Another Note from Fatty: The Kona Cadabra contest is now over. This evening I will do all the necessary spreadsheet magic (more work than you might think), choose, and notify a winner. You’ll be excited to note that when we began this drawing, we had raised $197K for the LAF. We have now raised $230K. That’s $33,000 in one week! Thanks so much for your donations and work in raising money to fight cancer. Ryan is a friend of mine from way back. When I first started riding, Ryan had most-trusted-mechanic status. He’s moved on to other things and it’s been a while since we’ve ridden together, so it meant a lot to me to see that he did the 100 Miles of Nowhere. I was even more pleased that he did the final lap on his Trek Mod — an adult-sized Big Wheel, basically. From what I understand, Ryan and his friends now do night descents down Squaw Peak (the same descent where Kenny turfed it a couple years ago) on their Mods. I am evidently invited to joint them sometime. I just have to bring my own light setup. I admit trepidation. But also intrigue. Read all of Ryan’s race report on his blog. Bruce had the outstanding idea of turning his race into a fundraiser, with the promise he’d do extra miles for extra donations. 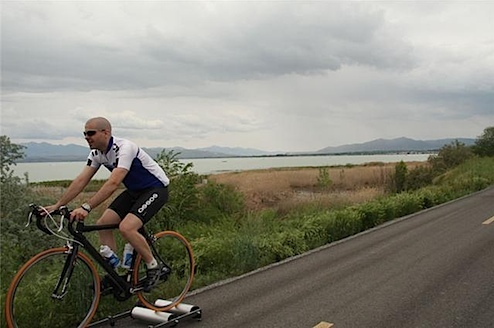 So he rode 111 miles on the block surrounding Heritage Park on Randolph Air Force Base. One of his co-workers ran a half-marathon opposite him–so they saw each other about a zillion times. You can read the complete report — including a torrential downpour, visits from friends, and contemplations on a dead bird he passed 120 times at Bruce’s site. Says Jon, “I cheated and took off all the resistance (and pumped up my tires nice and firm) so I could lock in a hard gear and ride like mad.” Jon finished in 3:36:20, with a 27.7mph average. Nice! I’m a little concerned about the fact that he chose not to wear a helmet, however. 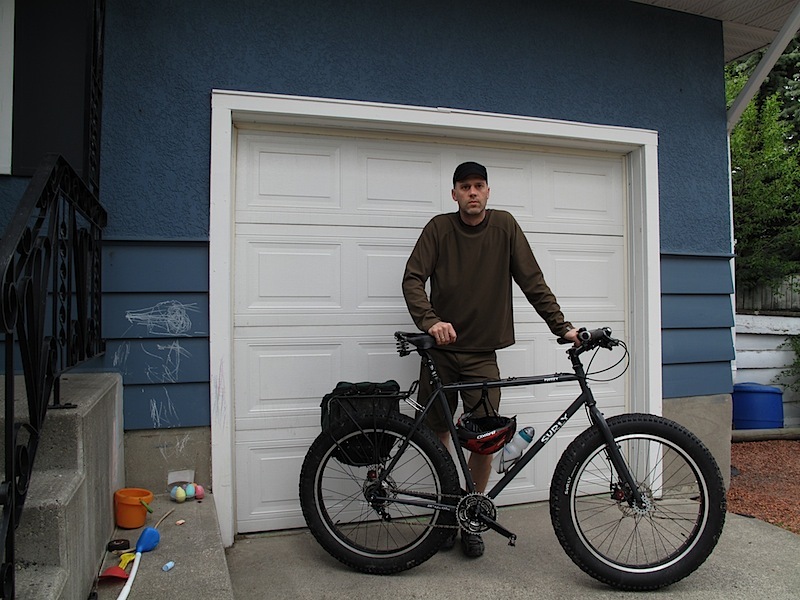 After dropping my son off at the dayhome, I headed home to gather up my gear and head out and see how far I could push my Pugsley in a day. My plan was to ride around the neighborhood and map all of the streets and alleys within 1 km of home with my GPS. However, I couldn’t find my GPS. I searched the house several times but to no avail (I did later convince myself that the number of times I did those stairs should count for 2 km). No worries though, I know the loop at the local park is 8 km long and it’s a 2 km long downhill jaunt to get there. 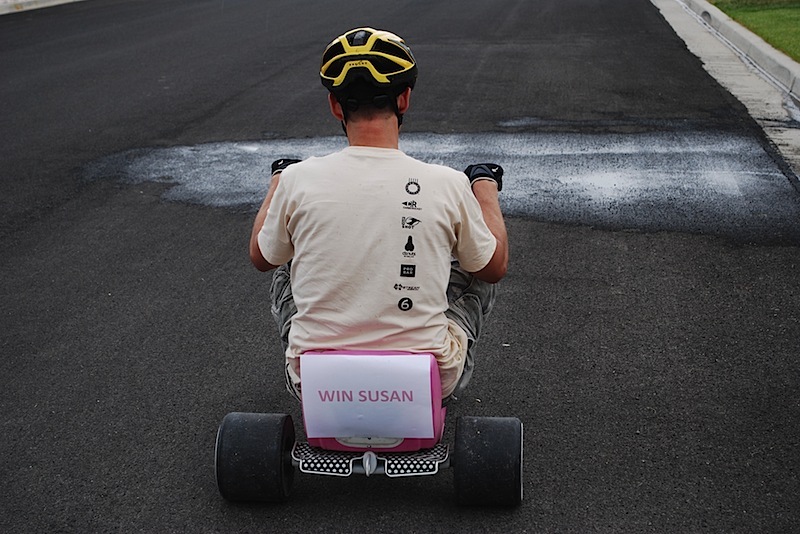 I got the usual stares associated with riding 4″ tires, but I think some people were just curious why they kept seeing me over and over again. If they’d asked, I’m not sure what I would have told them. I returned home at the 52 mile (read: km) mark for some lunch. Cold leftover pizza and chocolate bars, a true meal of champions. After watching the beginning of The Dirty Dozen, I returned to the Pug and the seemingly endless loop through Edworthy Park. By mile 70 (km) I started to think my newish Brooks saddle was finally broken in (I later concluded that the nerves in my @ss were just numbed). I returned home at mile marker 98 (km), tired and aching, but not too bad. Good thing I had those 2 km of stairs earlier to top me up to 100 km! I told myself I could push for 100 miles, but I had to cut it off there as it was time to pick up my son again (I also had several other excuses at the ready in case I needed more convincing). I know 100 km is well short of 100 miles, but I figure I’m not selling myself short since my tires are at least 4 times the width of most other bikes in this race, and my bike weighed in at what is likely twice the racer average. My overall time (minus lunch) was approximately 4.5 hours. I credit my win to selecting a category requiring an obscure bike that is likely the least desirable long distance road bike ever created (and I knew that Jill Homer was like 3000 miles away from her Pugsley). Team Phillips, riding in the Denville NJ division, were split between two categories. Mrs. Team Phillips, an amateur by her own admission, was riding in the women’s not-quite-40-by-mere-days category. Mr. Team Phillips was competing in the men’s more-than-40-but-nowhere-near-50-thank-you-very-much category. Mr. Team Phillips was confident he could complete all 100 miles, but in his own words, “not on some [expletive deleted] trainer”. To his credit, it was quite a beautiful day in northwest NJ, and he took full advantage of the regularly scheduled shop ride to complete the 37 mile first stage of the race. The second stage was 19 laps on a 3.4 mile loop, with minimal climbing (although steep, requiring him to get out of the saddle on every loop), beautiful scenery, and the warm spring sun (resulting in a distinctive cyclist’s tan by the end of the day). Although Mr. Team Phillips provided his own support (drinks, food, gels, and even an extra bike), he did get some additional support and photographic assistance from his friend Jay, who even rode along for 6 laps. 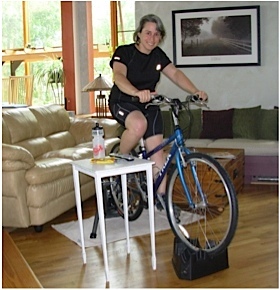 Total riding time for both stages was 5 hours 50 minutes, with an average speed of 17.3 mph. Without question, Mr. Team Phillips was the clear champion of his more-than-40-but-nowhere-near-50-thank-you-very-much category. In his post race interview, he muttered something unintelligible about “the alpacas” and thanked his wife, Mrs. Team Phillips, for encouraging him to sign up for this particular brand of torture. In my race, about 85 miles into it, a guy on his porch yelled out “Where you going?” I replied “Nowhere”. He shook his head and went back inside. I also passed a jogger about 20 times, she finally gave me a weird look when I think she finally realized I was the same cyclist passing her and waving. On the next time we passed I was going to stop and ask her for directions. But I think she got kinda weirded out and quickly left the course as I didn’t see her again. Which brings up an obvious question, roadies get dinged a lot for not waving. But how many times on a 1 mile loop should roadies wave to each other? In my race there were several bikers throughout the day going the opposite direction (the easy direction) should we have waved every time? It seemed the common number was 2 – 3 times then they figured out I was the same person and stopped waving. Yeah, considering what has happened recently (http://acidinmylegs.blogspot.com/2009/05/to-crash-out.html), you’d think I would’ve worn a helmet. Unbelievably, though, I survived without one. 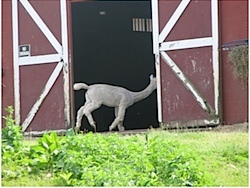 I love that photo of the llama/alpaca in the barn. I would have had a much nicer ride if there had been a few Andean animals hanging around, even though they would have probably just spit and shed on me. I really, really, REALLY want a Trek Mod now. Can I justify adding that to the stable as it’s not really a bike? Congratulations again to all the 100 Miles Of Nowhere competitors and thanks to you Fatty for getting everyone involved. Lots of drifting. Couldn’t make a few turns. Riding up on the dirt embankment was wild. Blows a rear tire at the end. NICE touch with the rollers outdoors! Fatty your readers are all so creative!! I found the rollers outside HILARIOUS. I don’t know if that’s what you were going for, but thanks just the same. I’m also concerned about Jon not wearing a helmet, but it is mitigated by the fact that his bike setup may need some tweeks. I’m convinced his seat needs to be raised 3/8″. This should yeild an improved power transmission in the 85-110rpm range and also take some of the pressure off his “thinking” region, thus allowing his memory to kick in on the helmet issue. Oh, and finally, never said it the other day but BuckytheDonkey and your London Crew…WELL DONE! Your 100M.O.N. vid was awesome too! These last few days have been GREAT reading!!! MattC Answers to your questions. Yes the front wheels have freewheels. 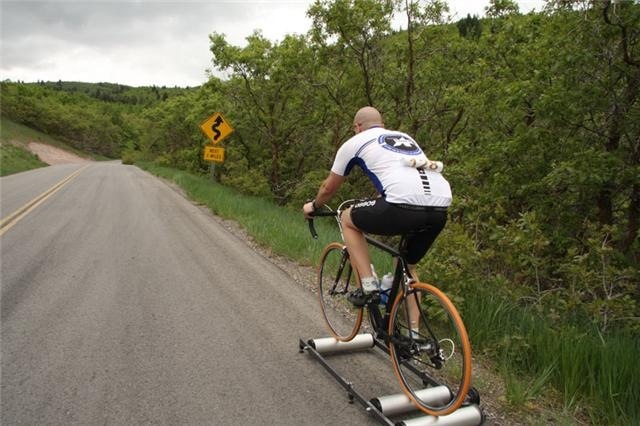 We used to do this as kids on non-freewheel bigwheels, talk about an ab workout, you had to hold your feet up while the pedals whipped wildly. Average speeds of about 30-35 with spikes up to 40. I can get about 15 five mile runs out of a set of wheels. The aero tuck is the key it is all about the drafting. We have a better video coming out soon. This is what I get for being too busy to read my blogroll for a couple months. I missed the coolest event ever!! 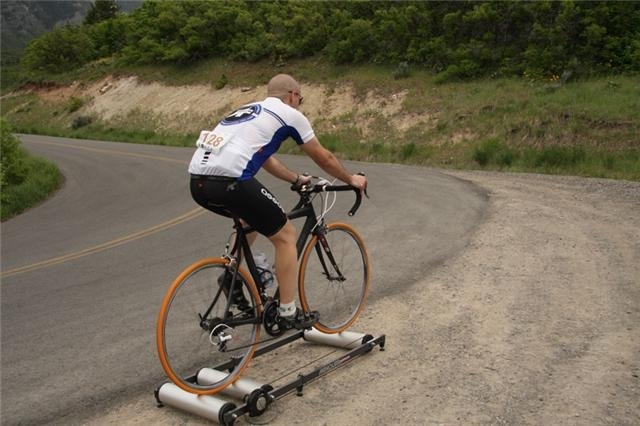 I should have tried this, but I can’t do a century right now. Too fat. I did, however, ride in spirit on Saturday for 33 miles. I’ve never laughed so hard in my life! Loving the John S. photos!